What is Zytix (Abiraterone Acetate) used for? How should I use Zytix (Abiraterone Acetate)? 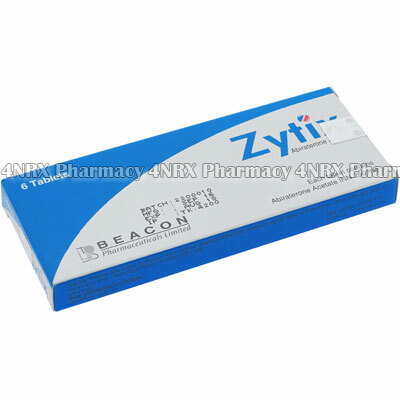 Zytix is offfered as a box of 6 tablets, Each containing 250mg of Abiraterone Acetate. Follow the dosage instructions given by your doctor including how much to take, when to take it, how often to take it and how long to take it. Abiraterone must always be taken on an empty stomach. Allow at least one hour before taking food after Zytix or at least two hours after taking Zytix. Do not crush or chew Zytix tablets. Swallow each tablet whole with a glass of water. What are the side effects of Zytix (Abiraterone Acetate)? Zytix can cause serious side effects including hypertension (high blood pressure), hypoklaemia (low blood potassium levels), edema (fluid retention), adrenal problems, and liver damage or liver failure. Symptoms you may notice if you develop any of these side effectts are listed below. Tell your doctor immediately if you notice any of these. Tell your doctor if any of the above side effects become troublesome or persistent while taking Zytix (Abiterone). Tell your doctor if youhave any of the above conditions or any other medical conditions. Zytix must never be taken by pregnant women or women who are trying to become pregnant, or by women who are breastfeeding or planning to breastfeed. Pregnant women must not handle Zytix tablets, unless wearing gloves. Tell your doctor about all other medicines you are taking (including prescription drugs, over-the-counter medicines, vitamins, and herbal supplements). Some of these may interfere with Zytix. Men who are sexually active with women while taking Zytix must use adequate contraception as Zytix can cause harm to unborn babies.